I would say, “Hurry up spring!”, but there really isn’t any need to say that this year. The temps are unseasonably warm and it feels like spring is already here! I am always okay with the weather getting warmer because that means there is more time to be outside in the fresh air. Springtime weather gets me excited for Easter. I went to Hobby Lobby so I could start planning out an Easter party for this year and I was happy to see they had started to put out Easter decorations and craft supplies. There was so much choose from, but I went with a white and gold theme for this year’s party. 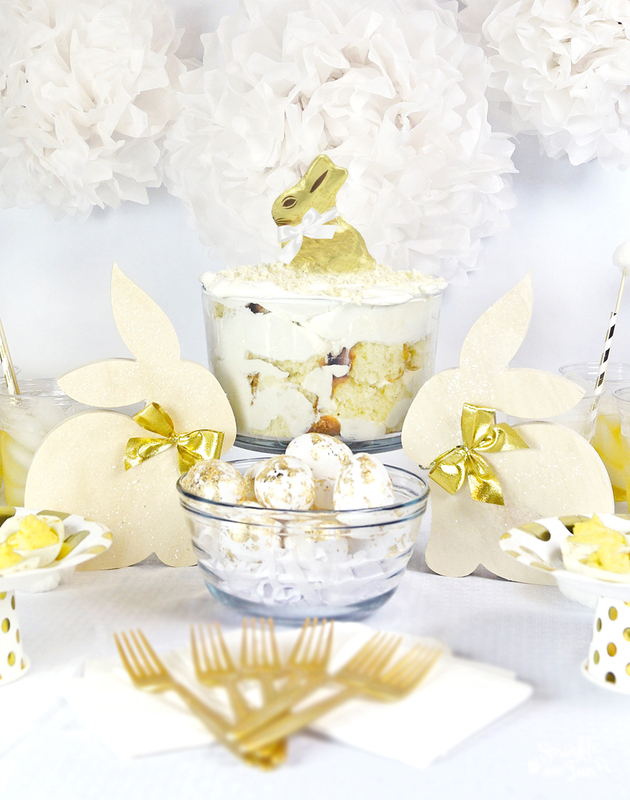 This Elegant Easter Party is a simple but elegant way to celebrate Easter. A few DIY craft projects will bring your total for the party well under $100. That’s my favorite kind of party! I bought everything you see here from Hobby Lobby except the food, bowls and the tablecloth (which I already had these). My total for the whole party was under $75 and with the food it was still under $100. Making a few DIY decorations really will stretch your budget and I always utilize the Hobby Lobby 40% off one item coupon too. 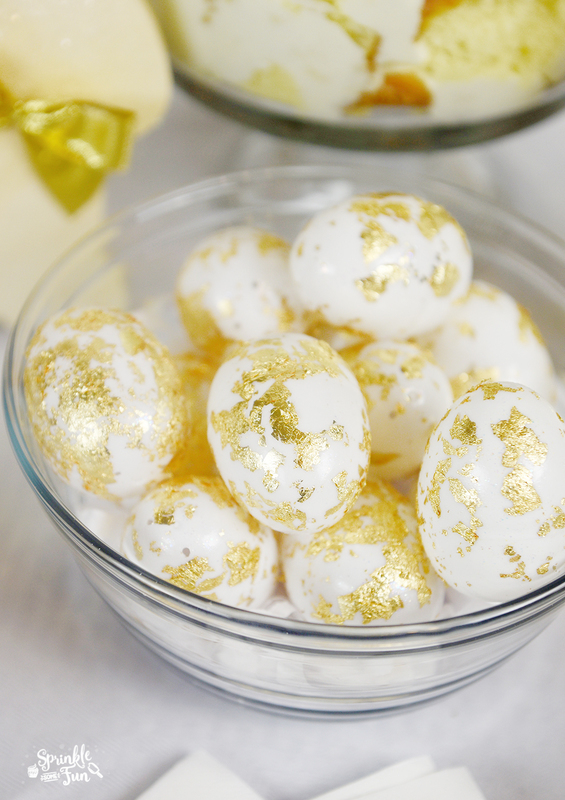 These gold flecked eggs are a cinch to make and really make an impression! I used a package of white plastic Easter eggs from Hobby Lobby which were just .99 cents at regular price. To make these: First get your craft space ready lay out parchment paper to dry the eggs or something else that the wet eggs won’t stick to. Then brush on a coat of decoupage medium on one egg first and while it’s apply the metal flakes with the second paintbrush to the surface of the egg. Finish each egg this way and then cover them all with another layer of decoupage medium and wait for them to dry completely. I just set these out in a bowl, but they should still be useable for egg hunting later on! For the background I found this Happy Easter sign. My daughter help me apply some decoupage medium to the surface (you can also use glue) and some gold glitter. 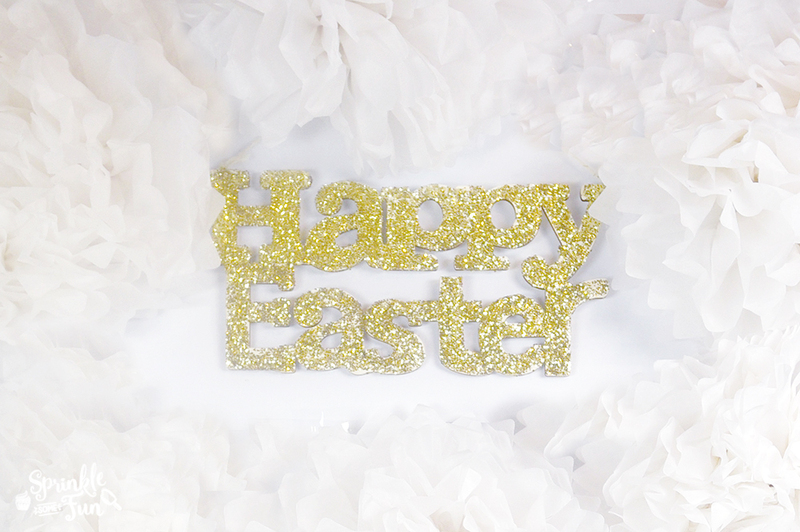 Super fast and easy DIY Easter decor. I put this up for a backdrop and placed some white paper flowers that I found in the Hobby Lobby party supply section around it. I love that they have so many party supplies like this. No more cutting out tissue paper for flowers! So easy! If you have followed my blog for any time… you’ll know I LOVE bunnies!!! When I saw this little wood bunny I knew it would be perfect for this party. My daughter applied the clear glitter with decoupage medium and I found the little gold bows in Hobby Lobby party supply section. We also added a big pom pom for the tail. 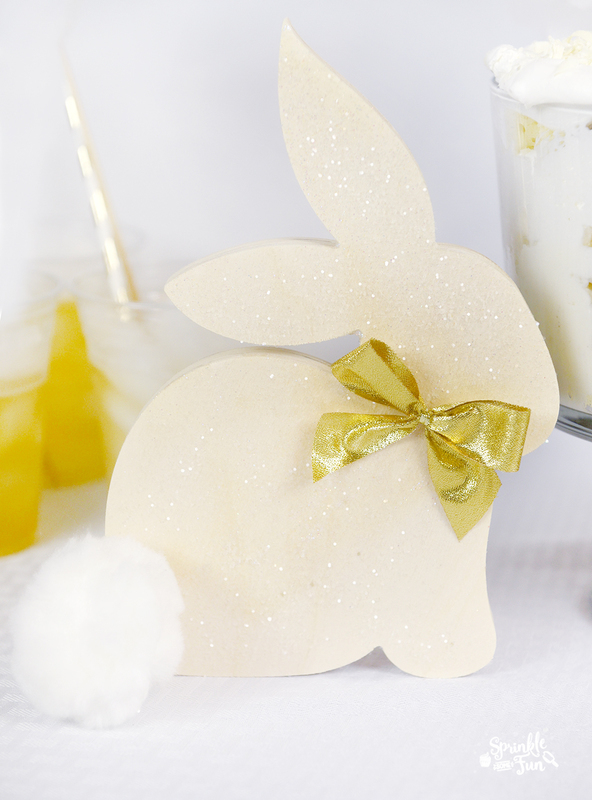 These little bunnies are perfect to display for any Easter decor. Let’s talk about food and drink. For this party I made my favorite Bunny Fluff trifle, but instead of raspberry cake I used white cake. 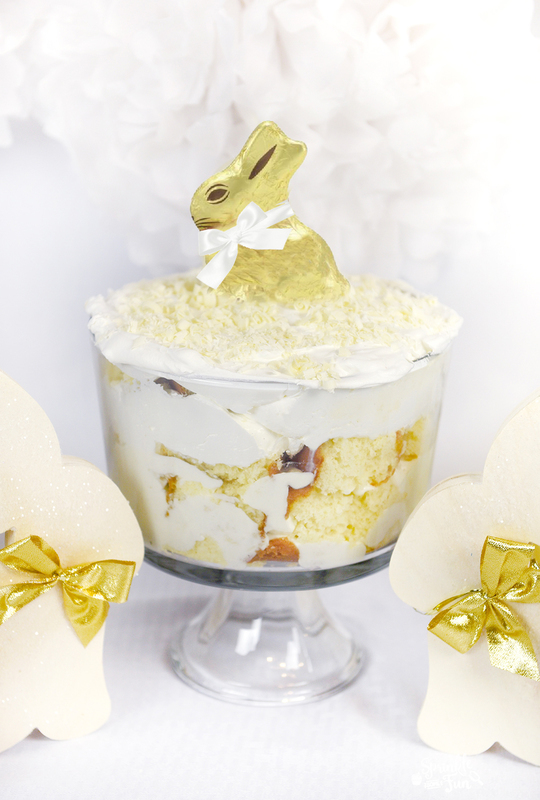 You can find the recipe for Bunny Fluff Trifle here. I also made Barbecue Deviled Eggs (my fave). 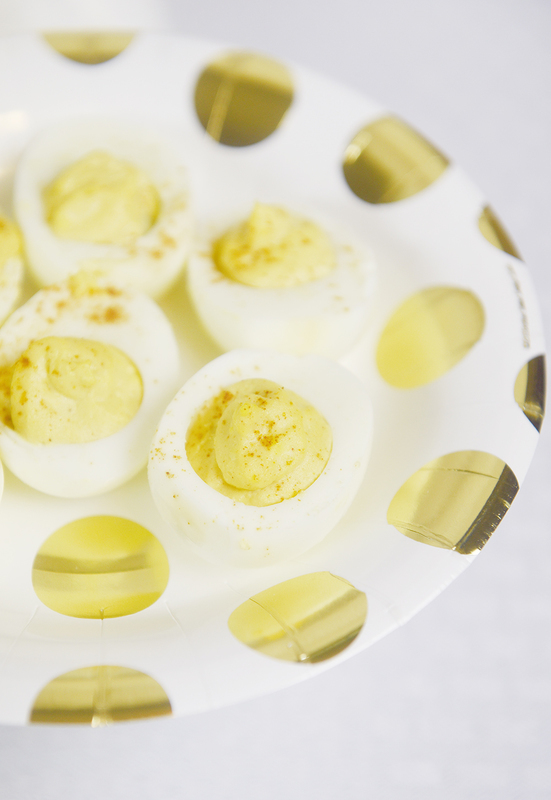 Find the recipe for Barbecue Deviled Eggs here. 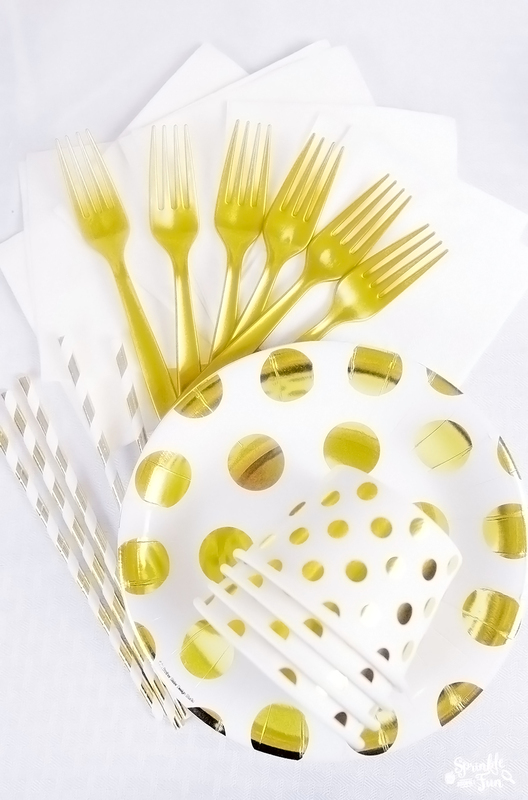 For the little stands I used these gold dot plates and gold dot nut cups that I found in the Hobby Lobby party section. Just glue the plate on top of the nut cup and you have an easy party stand! For the drinks we had sparkling juice with gold straws and bunny tail stir sticks. 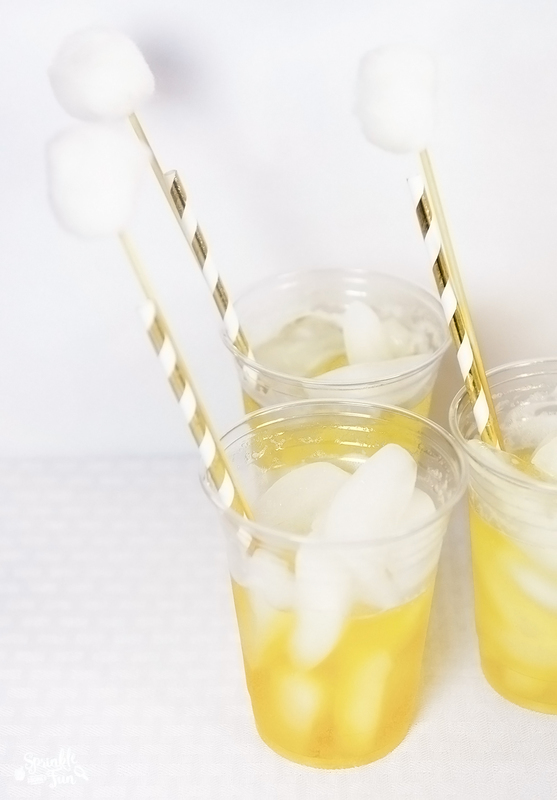 To make the sticks just get small white pom poms and 8″ wooden skewers. Then stick the sharp end of the skewer into the pom pom. It’s that easy! If you want to go all out then make this bunny punch recipe! I was very impressed with their selection of essential party supplies! From elegant to fun they had it all. I love all the gold supplies I found even down to the forks. Are you throwing an Easter celebration this year? 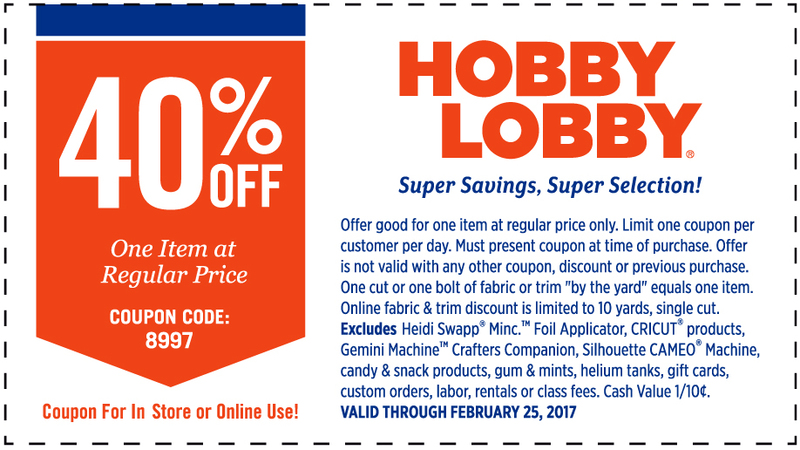 Be sure to check out Hobby Lobby for a great selection and great price! You can also grab a 40% off coupon here too!